U.K. 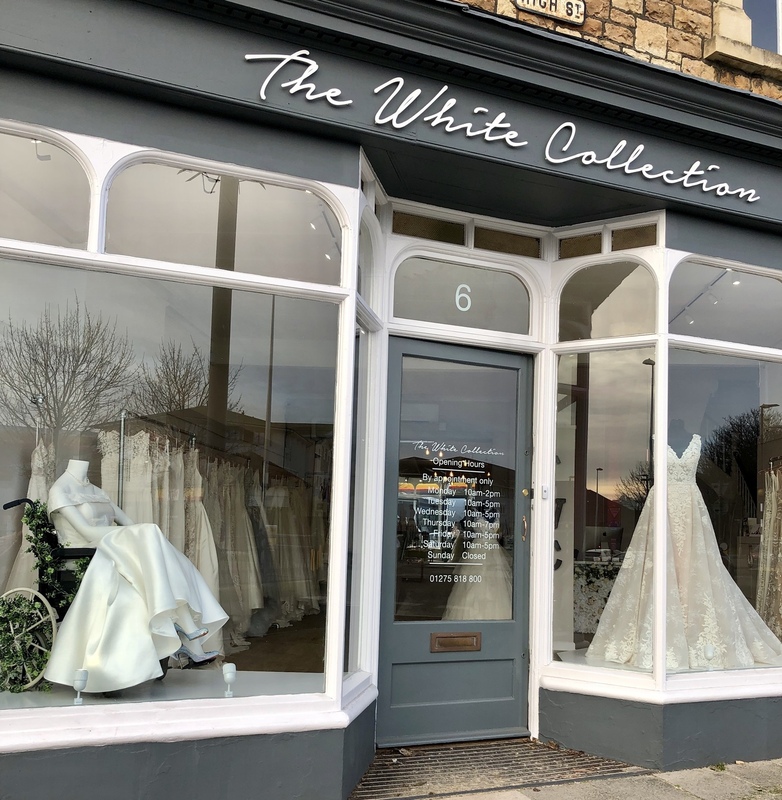 Bridal Boutique Celebrates Wedding Dresses And Wheelchairs A window display at the shop in Portishead, England, went viral on social media for featuring a mannequin wearing a wedding dress while in a wheelchair. 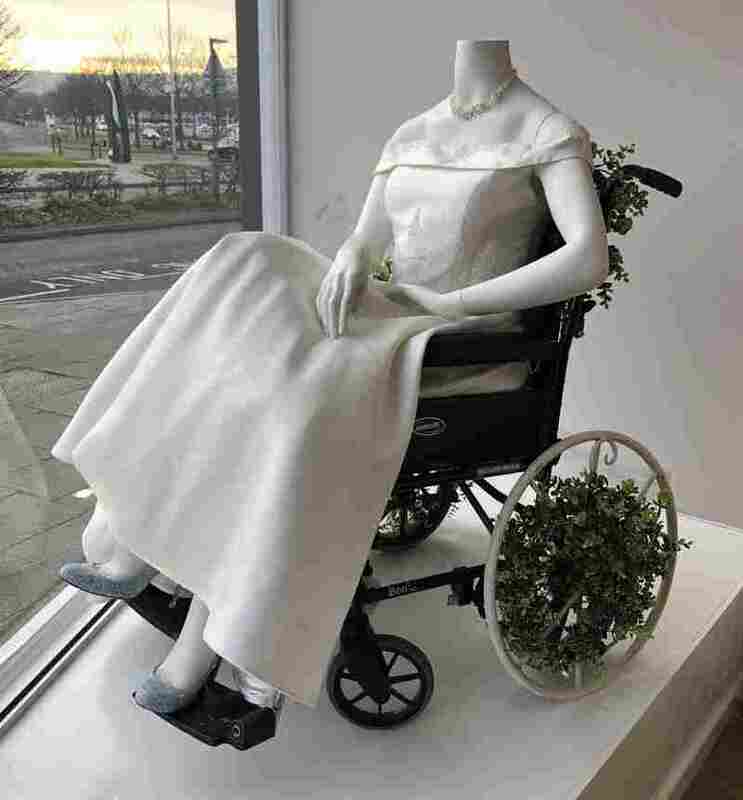 A bridal mannequin sitting in a wheelchair in a small shop display has gotten big attention. Bridal shop co-owner Laura Allen didn't think it was a big deal when she had the idea to put a window display mannequin in a wheelchair. The mannequin, affectionately named Prunella, sits in one of the two storefront displays for The White Collection, a small bridal shop in Portishead, England. Prunella wears a beautiful white wedding dress with a flowery boat neckline and a fabulous pair of Louboutin shoes. The display caught the eye of artist Beth Wilson — who uses a wheelchair. In a tweet she wrote, "it shouldn't be exciting but it's the first time I've ever seen disability portrayed in a shop window." The tweet went viral, putting Prunella on even larger display as people around the world starting vocalizing their support and appreciation for the inclusive display. "That's created this absolute frenzy and this outpouring of messages on this debate that more shops should follow suit," said Allen's sister and shop co-owner Sarah Parker. "This shouldn't be an unusual thing to see in a shop window." A stream of visitors has come to take pictures of the the display, including little girls in wheelchairs. Allen and Parker have been overwhelmed by how much their display has meant to people, including U.K. resident Maria Coehlo. Coehlo has had to constantly advocate for her daughter ever since juvenile arthritis put her in a wheelchair at age 17. She and her daughter, now 21-years-old, are used to meeting barriers. "People's perception of her is changed because the mobility aid is what they perceive," Coehlo said. "They don't see the vibrant, beautiful, intelligent, incredible human being that uses the tool as a way of getting around. They just see the condition or the disability." With the window display, Coehlo said they had something to celebrate for once. After she learned of the display, she called the shop to thank them. "I just thought how incredible, how amazing, at last," she said. "Someone has just normalized that wheelchair and that normalizes my daughter." Allen and Parker change their window display every month. They're not sure what they'll put up for February, but they're taking suggestions.